Every year, thousands of aspiring students aim at pursuing one of the most sought after career options, engineering. There are government as well as private engineering colleges that brim with aspirants from different parts of the country. Those, who are highly scholar and have managed foreign scholarships, even go to foreign engineering colleges to pursue their dream of becoming an engineer. But, this is not the case with all the engineers. The engineering aspirants mainly aim at the most prestigious engineering entrance examination in the country – GATE. The Graduate Aptitude Test in Engineering (GATE) is the sole and the best engineering examination to take the master’s degree in some of the basic and most common engineering streams in India. One of the streams of disciplines among these that receive maximum applications is Computer Science. Students constantly have the common question in mind, how to prepare for GATE computer science entrance examination. The post-graduate engineers or aspirants, who have completed a four-year engineering course or equivalent, after class 12 examinations, can sit for the GATE examination. This all India examination is administered by the faculty members of the reputed institutes like IISC, the National Coordinating Board, Department of Education, Ministry of Human Resources Development and the IITs. The GATE score or rank is meant for the students to take admission in the Masters of Engineering or ME, MS, Masters of Technology or M. Tech or for direct admission into the Ph.D. courses. There are 23 papers or disciplines in which the students can apply for. However, a student is allowed to apply for only one of these 23 subjects. As one of the most prestigious examinations in the country, GATE score or rank is not only considered to be the entry pass for prestigious institutions for postgraduate studies, but also for lucrative job opportunities. Start with preparing for the subject that requires maximum attention, time and practice. The easy sections should be studied later; once the difficult or more important chapters are done. The 90 days preparation plan would include reading, thoroughly understanding, revision and practicing of the syllabus. Your focus should be on understanding the basics or fundamentals. The practice should also include various question sets as well as quizzes. Revision notes must be made for all the relevant topics as well as for those topics that you are least confident about. Follow and participate in online debates and discussions regarding various GATE CS topics. If you follow these steps for your GATE CS preparation plan, you will certainly be able to complete your syllabus fast and prepare yourself for the exam. There are many books on the market that explain and discuss these problems in details. Having a clear concept of these subjects and disciplines is a must. It usually takes about 9 days to go through all of these sections for an engineering or technology student. If you are currently in the last semester of your course or have recently passed your degree or diploma course, you will certainly be in touch with these disciplines. Hence, it should not take more time than this. Practice as many questions and problems as possible, to sharpen your skills. This is the key to success if you want to know how to prepare for GATE computer science entrance examination. Reasoning and Quantitative aptitude is something that is a basic for any entrance examination. You do not have to worry much about this. This takes far less time to prepare than the other major disciplines and subjects. Follow your syllabus books or buy some online. In fact, there are numerous materials that can be found online, if you don’t have any in your possession. This is another important section that you must read thoroughly. CPU scheduling, threads, Page Replacement Algorithms, Semaphores, Deadlock avoidance algorithm, Paging and Segmentations, and Disk scheduling, etc. should be studied carefully. Those, who have doubts in any of these topics, should consult the best books in the market. If you are not sure about how to prepare for GATE computer science entrance examination, consult the professional institutes that offer online as well as offline classes, discussions, mock tests and study materials. The key topics under database subject that a GATE CS aspirant or applicant must study would include Integrity constraints, Normal forms, tuple calculus, Relational algebra, and SQL. Context-free languages, finite automata, undecidability, regular expressions, pumping lemma, grammars, etc. are some of the key topics that you must practice. Follow a good book, and you will be able to have a clear knowledge of these topics. The GATE CS exam topics of interest under Compiler Design would include Phases of Compiler, Lexical Analysis, LR Parsers, LL(1) Parser, Follow set computation, First set computation, etc. Cache organization, pipe lining and addressing modes are some of the most important topics in this subject. Now that you have got a clear concept of the syllabus, topics of interest, and the tips you must keep in mind while preparing for the GATE CSE, it would not be difficult to plan how to prepare for GATE CSE branch. Plan in advance, and you will surely crack the test. The best part is that there is no age limit or appearance limit for this examination. But, if you want to start your career in the best possible way, this is the exam that you must target on. 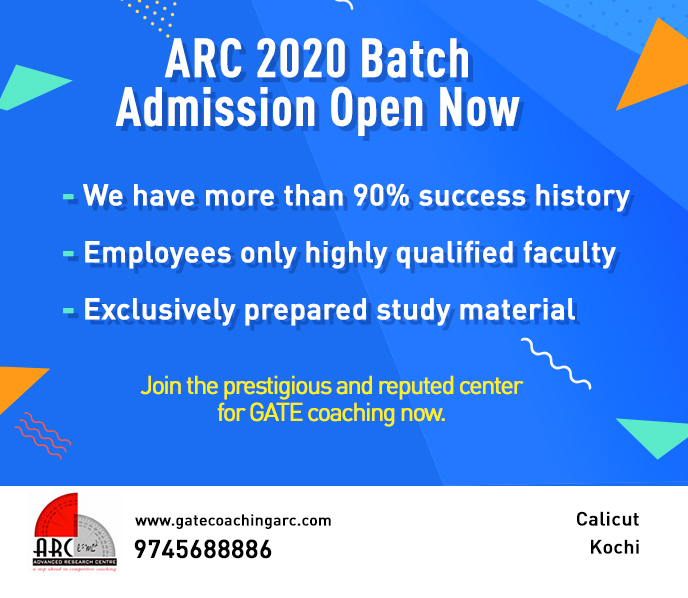 ARC Foundation is one of the best GATE Coaching centers in Cochin. 1000’s of students who enroll in our coaching center have successfully cracked the GATE and are into some of the best colleges in our country. Are you planning to take up GATE 2018? Lack an idea of how the examination will be? Contact us today and we will help you out.